If you need to pump concrete for your construction project, you may have heard that you have two options: the boom pump and the line pump. Concrete pumps are a convenient way to pump concrete, as they allow you to deliver the concrete exactly where you need it, rather than requiring you to try to continuously reposition a heavy cement mixer or haul concrete from the mixer to the delivery site. But how do you know when to use a line pump and when to use a boom pump? Here are the advantages and disadvantages of using a concrete boom pump vs. a line pump. First, it is important to understand what a concrete boom pump is, vs. a line pump. A boom pump is a concrete pump that you mount on a truck (hence it is sometimes called a “truck-mounted pump”) and that uses an arm (the “boom”) that you control remotely to deliver the cement where you need it. The main advantage of using such a pump is that it allows you to pump a lot of concrete in a very short amount of time, even from great heights, and with great accuracy. 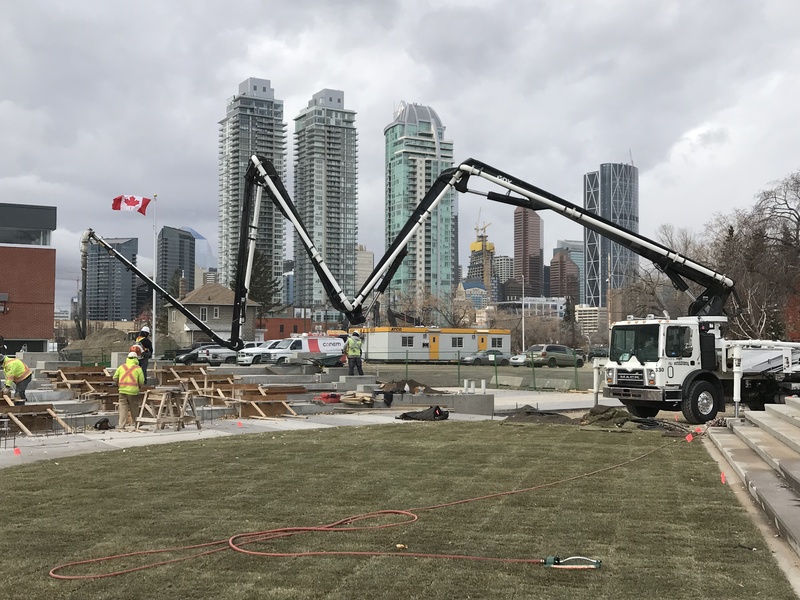 Because of its speed and high-volume capacity, a concrete boom pump will usually be the best choice if you have a large-scale project that requires a lot of concrete, such as the construction of an apartment building or another large facility. A line pump is a long hose attached to a stationary pump mounted on a trailer. This hose allows you to more easily direct the concrete pour and is great for horizontal pumping, as you can extend the hose virtually as long as you need it. Because of its flexibility and lower-volume capacity, you will more commonly use a line pump for pouring concrete on smaller residential jobs, like building a swimming pool or repaving a driveway. In summary, if you are doing a larger project or a commercial project where you need to pump a lot of concrete fast, you probably want a boom pump, which can spit out over 150 cubic yards of concrete per hour. Boom pumps are also a better fit for big commercial jobs because they can reach higher into the air and because they tend to be a bit more expensive than line pumps. In contrast, if you are doing a smaller commercial job or a residential job, a line pump is usually a better choice. You have more flexibility as to where you can deliver the concrete and you will save money relative to a boom pump. The concrete does not pour as fast, but it will usually be sufficient for the needs of a smaller project. For more information about boom pumps, line pumps or concrete pumping in general, contact us now at Dynamic Concrete Pumping.